Pretty much every respectable restaurant was closed on New Year's day on the Westside but I knew I could count on Chinatown and Koreatown to satisfy my taste buds. My cousin and I had a wonderful girls' day out and started the day with two steaming, flavorful bowls of pho at Pho Hoa in Chinatown and after a long day of shopping and a movie (Up the the Air is great! Go watch it! ), we decided to hit Park's BBQ. We were sooooo glad we did. The place was hopping on New Year's day but we only had to wait about 20 minutes before we were seated. The restaurant was clean, tables/booths were well-spaced and the ventilation must have been strong because we never felt the smoke was in our face. 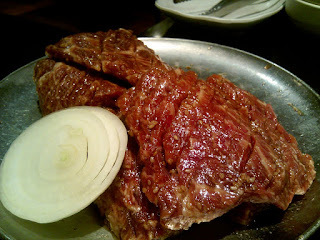 The service was surprisingly good at Park's; our waitress put all our meat on the grill and came back frequently to check on it, cut up the meat and refill our banchans and drinks. Park's was attentive about changing grills. 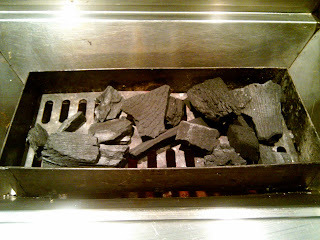 Ours was changed three times and the waitress changed the grill each time before she put on new meat to cook. 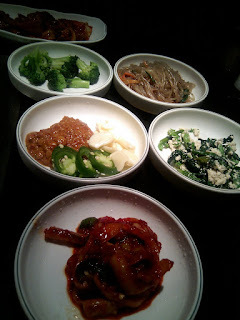 The banchan was great in terms of variety (8 kinds) and quality; I loved the cold vermicelli noodles, the chive tofu, kimchi, octopus, cold broccoli with sesame oil and the sweet potato salad. 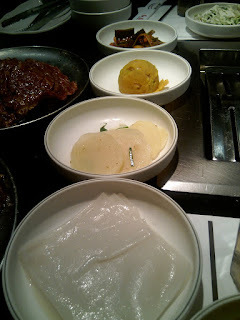 Besides lettuce, Park's also includes the rice paper wraps (duk bo ssam) to wrap your meat. 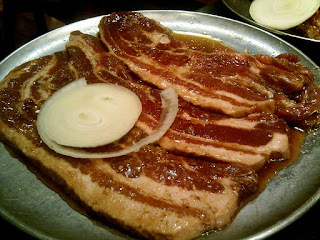 I was really happy to see this pork belly had a lot of meat. Some pork belly at AYCE joints have too much fat. The marinade was a mixture of sugar, soy sauce and sesame oil. Ahhhh, this was so good. The meat was tender with a good amount of marbled fat in the thick chunks of USDA Prime meat. Park's is not AYCE but the quality and quantity of this Kalbi sure shows that you get what you pay for. Hehe, this is where you can fill your veggie quota. The portion is perfect for two people to share if you just want one bowl of rice. The two of us were stuffed and the damage was only $40/pp which is normal for a non-AYCE Korean BBQ joint and the quality of the meat/food and service was totally worth it. I can't wait to gather a big group of friends and go back to try the other cuts of meat and their famous Beef Short Rib Soup. Funny I was just thinking about Tokyo X pork last night as I was about to draft up "most overrated of '09" post. 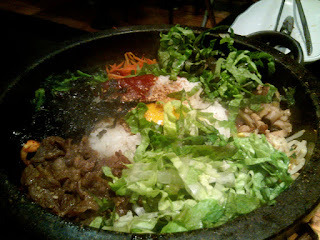 For me, Park's falls into that category, as Chung Dam straight kills their meat quality. No doubt, the panchan selection is tremendous at Park's, but for the price, Chung Dam is far superior. Have you visited Dong Dae Gam? Love that place. I haven't tried Chung Dam. Dong Dae Gam has been recommended to me. Can't wait to try them both soon. Thanks for the tip. Iberico de Bellota Ham Back at Surfas!